Guest House 1,200 sq. 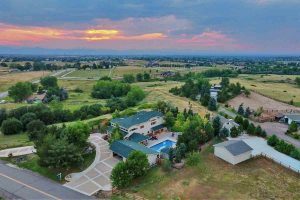 ft.
Have you ever dreamed of owning 5.5 acres in the heart of Lone Tree, Colorado? Now is your chance to stop dreaming and start living! Enter a world of peaceful nature and unobstructed Rocky Mountain views. The circular drive and tranquil water feature lead you to the Main Estate featuring 4 bedrooms, 2 Master Suites, complete with steam shower and kitchenette; Main floor study with wraparound front porch, floor to ceiling windows, Brazilian Cherry hardwood, professional grade gourmet kitchen, 2 laundry rooms, finished basement with new carpet, tile & paint, theater, climate controlled wine cellar and breezeway to finished 4 car garage. Take a dip in the pool with your horses nearby. The fully fenced pasture accommodates up to 10 horses. Watch them graze or enjoy a ride. The Carriage House is the perfect oasis, complete with kitchen, 2 bedrooms, office and detached 2 car garage with private driveway and address. Country living with all the amenities of the city. Why wait?